An excellent, traditional sweet and sour dish enrich with Knorr Chicken Seasoning & Hellmann’s Real Ketchup. It is great served with steamed rice!" Follow the recipe below! Combine all the ingredients (except prawns) in a mixing bowl; whisk them well to form a batter. Dip the prawns in to this batter and deep fry them till golden. Heat the oil in a wok or pan and sauté garlic and ginger. Add Hellmann’s Real Ketchup and sugar; cook while stirring till it starts bubbling. Now add water, Knorr Chicken Seasoning Powder, vinegar, Soy Sauce and bring to boil. Stir corn starch little at a time in the sauce and cook for few minutes till desired consistency. Add all the vegetables (except spring onions) and cook for few minutes on low heat. 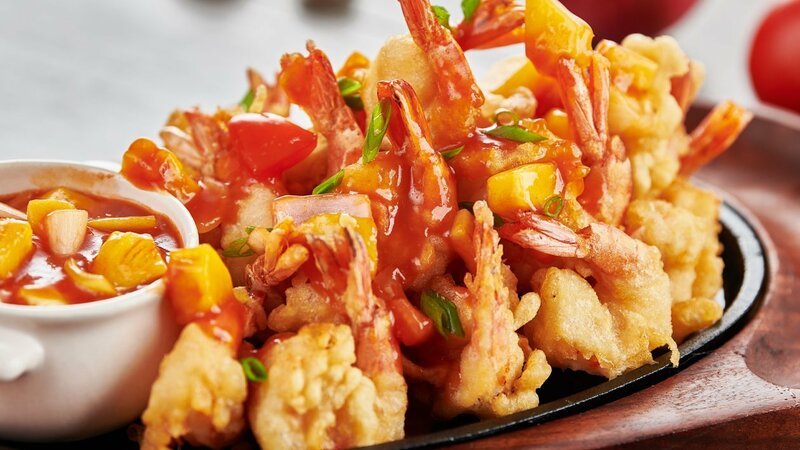 Arrange the fried prawns on a platter and pour the sauce on top; serve immediately or mix the fried prawns in the sauce along with vegetables, garnish with spring onions and serve immediatelywith steamed rice.